Please note our BBFC rating for Allelujah! will now be a 15, as it contains “strong language” throughout. Performed from the Bridge Theatre Company. 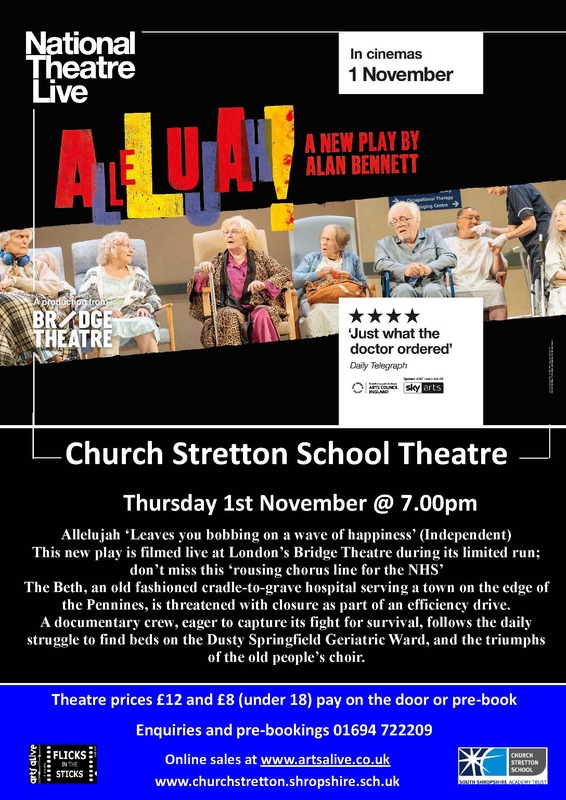 Alan Bennett’s sharp and witty new play is ‘just what the doctor ordered’ (Daily Telegraph). Set in a local hospital facing closure as part of an efficiency drive, this state-of-the-nation piece is a ‘rousing chorus line for the NHS’ (Observer). This is not a live showing but it will have been ‘Filmed live in front of an audience’. It would be good to know if this might be of interest to our audience. If you might be interested please let us know by email to alandavidfox@live.co.uk , or by phone to 01694 722209.